Quix is a customizable command driven bookmarklet that can be used in most of today's web browsers including Microsoft's Internet Explorer, Mozilla's Firefox, Opera, Google Chrome or Safari. It is basically a mixture of Mozilla's Ubiquity and an extended search add-on like Cybersearch for Firefox in the form of a bookmarklet. The bookmarklet needs to be dragged and dropped into a toolbar of the web browser and a click on it will open a prompt that accepts commands. 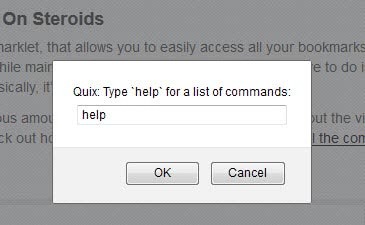 A good start is to use the help command to open a page in the browser that displays pre-configured commands that can be used in Quix. This ranges from basic commands like performing searches in various search engines and sites like Google, Wikipedia, IMDB or Flickr, social commands that bookmark the page at Delicious, share the page at Facebook or tweet the current page to Twitter, Seo related commands that perform specific searches that are relevant to search engine optimizers, url shortening commands or webmaster related commands like validating a website, registering a domain name or displaying a ruler on the page to measure elements. %s - Replaced by any search terms that were entered after the command and / or any text that was selected when the command was issued. %r - Replaced by the URL you were on when the command was issued. %rs - Replaced by a bit.ly shortened version of the URL you were on when the command was run. %d - Replaced by the domain you were on when the command was run. %t - Replaced by the title of the page you were on when the command was run. Quix offers several benefits over running a plugin or add-on that offers a similar functionality. It is browser independent, does not take up memory or processing power when it is not running and will not cause stability, performance or security issues that add-ons or plugins can cause. Quix is available on the the project's website.